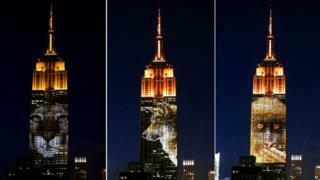 New York's famed Empire State Building hosted new guests on Saturday night as images of endangered animals were flashed across its facade. The unique display, on one of the world's most recognisable structures, was aimed at sparking conversations about mass extinction. Pictures of snow leopards, tigers and various sea creatures were shown. A 350ft (106m) image of Cecil, the famous lion killed in Zimbabwe earlier this month, also appeared. Organisers said the event was a "first-of-its-kind" live video projection. It drew huge crowds of spectators, who stopped to gaze at the display and capture their own pictures. In all 160 species were shown, including marine mammals, insects, and even the shadow of King Kong climbing up the building. The eight-minute sessions were repeated every 15 minutes from 21:00 to 24:00 local time (01:00 to 04:00 GMT) and were visible from almost 20 blocks away. The Empire State Building is one of Manhattan's highest structures, standing 1,250ft (381m) tall. Up to 40 large projectors were used to shine the striking images on to its facade. The event was organised as part of a promotion for a new Discovery Channel documentary, Racing Extinction, which is set to air in December.